Love Letters is a drama-romance, and a rather subtle and moving one. The basic idea is that of proxy wooing, a process by which a shy, unattractive, or incompetent would-be lover gets a friend to handle the courtship, at least in its initial stages. This is a natural generator of comedy, but part of the comic tension is the risk that the inevitable confusion and entanglements can fall off a cliff into tragic disaster. In Love Letters the comic aspects expire almost immediately, and soon romance and tragedy swirl together, finally seeming to meld inextricably. The story opens with several British soldiers in Italy during World War II. 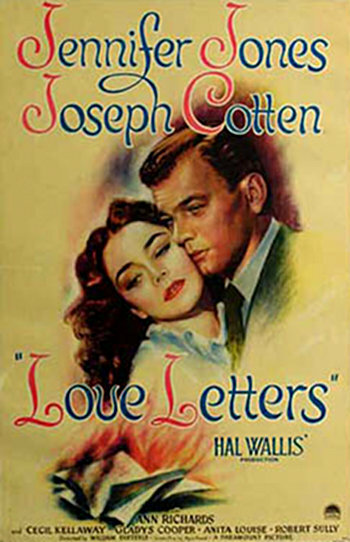 One (played by Joseph Cotten) has been inveigled by his buddy (Robert Sully) to write love-letters back to Britain, to a girl neither has ever met. The unaffected and poetically sincere letters of the first soldier succeed, causing the girl to fall in love with the second. Our hero's conscience, and his increasingly heartfelt — albeit pseudonymous on his side — mutual correspondence has brought him unexpectedly and unwillingly into a distant, and unacknowledgeable, love in his own right. As a side note, one of the most famous examples of proxy wooing is Edmond Rostand's play Cyrano de Bergerac (1897). This was a lifelong favorite of the film's screenwriter, Ayn Rand. Back in Britain, Love Letters continues in ways unexpected by all. The lovely girl calling herself Singleton (played by Jennifer Jones) appears, and our hero begins falling in love with her. But Singleton has drawn a curtain of amnesia across all the years since she was in an orphanage as a girl: she functions well enough in society, as long as any of a number of ordinary events don't trigger her into emotional upsets. As the plot progresses, elements of mystery are seen to be elements of tragedy, with receding possibilities of an outcome that is both stable and sunny. The writing, direction, and cast all come together nicely. The film seems too self-consciously atmospheric here and there, but the acting and dialogue bring it off nicely. Jennifer Jones shines as the lovely, innocent, and vulnerable amnesiac Singleton; the move posters and covers do not do her justice. Love Letters makes you care, and keeps you in suspense. Very enjoyable.